Captain Foer and his crew prepared and delivered my newly purchased 32 ft sport fishing boat from Maryland to Pt Pleasant NJ in July 2015. He inspected the boat and prepared everything for delivery. He kept me informed as he preparing the boat and delivered the boat safety and on time. He even cleaned her after securing her in my slip. Everything was handled in a efficient and professional manner. I highly recommend Capt.Foer for any of your boating transport needs. Rich T., Princeton, NJ. Paul concentrated on personal safety at sea. He constantly emphasizes navigating and handling the old fashioned way; with binoculars, paper charts, and without bow thrusters. Because of Paul’s insistence that I don’t rely on the bow thruster, I was able to calmly handle a situation and even looked cool doing it. Paul also emphasizes handling crew overboard scenarios. Although learning how to dock the boat and to navigate to new destinations may be more interesting to the new boat owner, the serious trainee will want to get as much training in this area as possible. The consequences of a mishandled person overboard situation are much more dramatic that crunching your swim platform on the piling. We recognize and value the training Paul provided us. His safety related admonitions echo in our head as we venture out own our own. I respect his sober and honest assessment of our abilities at each stage of our training. 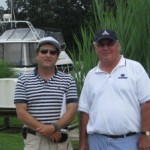 In May, 2007 I hired Paul Foer to serve as Captain on my Alberg 35 classic I had just purchased. We brought the boat from Solomons Island, MD to Port Washington, New York. From the start to finish, Paul exhibited professionalism, good judgment and solid seamanship and navigational skills. We had to perform a number of underway repairs and maintenance together, including dealing with fuel supply problems which we both managed to jury rig a solution. We encountered strong headwinds, cold temperatures and seas and very busy shipping traffic approaching New York which made for an exciting trip. We still arrived within our planned timeframe. I highly recommend Paul for deliveries or instruction. 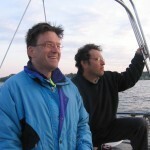 He was a pleasure to sail with. 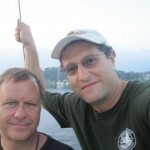 My son and I hope to sail with Paul again. Solomon's Island at dusk. We got up at 0300 the next day and left in the dark, again battling headwinds and a strong chop, especially off the Potomac, as Paul warned would happen. We entered the Rappahannock late on what had been a lovely afternoon but Paul become concerned about weather conditions and made sure we got sails down and prepared for bad weather. We were hit with a squall that we later learned was in excess of 50 mph, but we had prepared for it as Captain Paul had insisted. Paul is professional and highly capable. 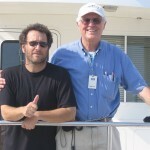 I learned a great deal from him and would highly recommend him as a delivery captain or sailing instructor. 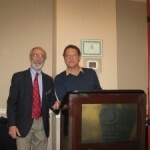 Paul Foer was the guest speaker at the annual brunch of the Pearson Sailing Association held at the Doubletree Hotel in Annapolis on April 6, 2014. Paul’s presentation was on safety and seamanship in a high tech world, a subject on which he is eminently qualified to speak. He presented several examples of sailors getting into trouble and the mistakes they made. More often that not, it was relying too heavily on electronic devices and not enough on old fashioned seamanship and knowledge and awareness of one’s surroundings. We were transitioning from sail to power and in a couple of days Captain Foer taught us all we needed to know to operate the new power boat and a lot about exploring the Chesapeake Bay. What’s more we had a terrifically enjoyable time doing it. I recently purchased a Post 56’ and needed some help getting familiar with the boat. Paul spent time with me on maneuvering, navigation and safety. Over the course of a few days, Paul was able to work with me on everything from basic knot tying to proper safety equipment. He was easy to work with and likes teaching! 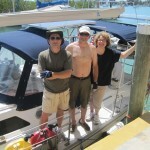 As a new power-boater, I found myself in need of training in the basic skills of boating. I spent an entire day with Paul Foer in which he covered safety, docking, anchoring, knots, boat handling, right of ways, and more. 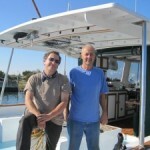 One year later I traveled 750 miles down the Intra Coastal Waterway and I owe Paul a tremendous amount of thanks. 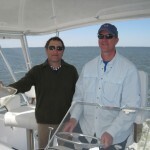 Captain Paul and his mate delivered my 42’ custom from East Hampton NY to Annapolis. Unfortunately, on route, she suffered multiple annoying malfunctions as well as a couple of legitimate offshore breakdowns which required the crew to improvise in order to continue the voyage. However, when she started taking on water through the compromised stuffing box, running into clogged fuel filter problems, experiencing bilge pump malfunctions, Captain Paul not only was able to get her safely to shore, but also see to it that she was in good hands for necessary repairs, before switching around his professional and personal schedule in order to complete the delivery. He kept me informed at my home in California at all times and sent me detailed photos and contact info. I have worked with multiple delivery captains over the years on multiple boats and Paul is by far the most knowledgeable, experienced and concerned. He treated my boat like it was his own. I highly recommend Paul for deliveries or instruction. I have learned very much from a great teacher. Paul is highly professional, trustworthy and reliable in all respects. 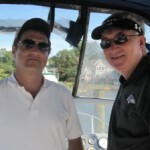 It is true that a boat is a hole in the water into which money is thrown, but hiring Captain Paul was money well-spent! I am now looking forward to enjoying my boat with my family. I have worked with multiple delivery captains over the years on multiple boats and Paul is by far the most knowledgeable, experienced and concerned. He treated my boat like it was his own.